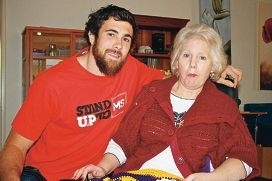 West Coast Eagle Josh Kennedy and Fern River resident Susan Fisher. During the three-day backyard blitz, the volunteers created wall art, built water features, installed new shade cloth, and provided new tables and chairs for the 10 residents at Fern River’s high-care facility in Wilson. ‘It’s fantastic that these employees have come down to work in the gardens, it makes a real difference to the residents here,’ Kennedy said. Fern River resident Susan Fisher grows her own herbs and was pleased to see the backyard blitz in action. ‘I might have multiple sclerosis but there’s always someone worse off than I am,’ Ms Fisher said.